Upon installation and activation of the WooCommerce plugin, Popup Maker adds a set of WooCommerce conditions to the plugin's standard targeting conditions. Within the Popup Editor, view these newly activated conditions on the 'Targeting' option tab of the 'Popup Settings' box. Select the drop-down custom field labeled 'Choose a condition to get started'. This Condition loads the popup on all WooCommerce Pages. Loads the popup on only the Shop Page. Loads the popup on only the Cart Page. Loads the popup on only the Checkout Page. Loads the popup on only the Account Page. Is Endpoint Conditions - When a user hits a certain stage within a WooCommerce site, WC refers to that as an endpoint. 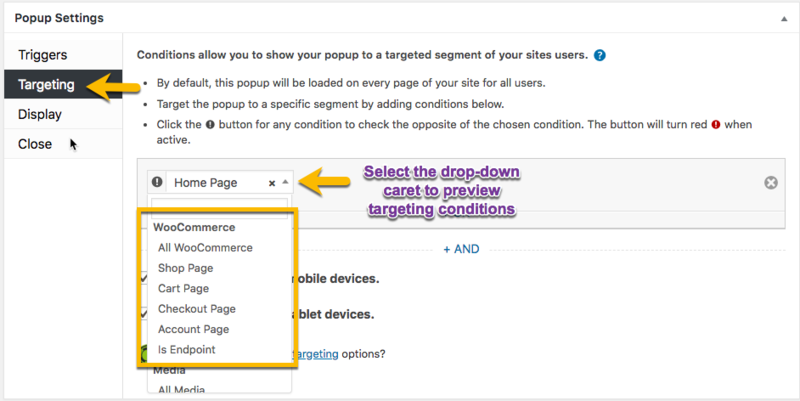 The following Popup Conditions will load popups only on these endpoints within WooCommerce. Read more about WC Endpoints. 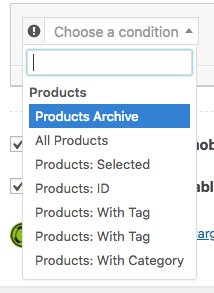 This Condition will load the popup on the Products Archive Page only. Loads the popup on only the Products Pages. Loads the popup on only the Product Pages you select. Select Product Page(s) by typing and clicking what is available. This works the same as Products: Selected, but uses Product IDs instead. Loads the popup on only Product Pages that have been Tagged with the Tag(s) that you choose here. Loads the popup on only Product Pages that have the Category(s) that you choose here. Loads the popup on only Product Pages that have the Tag(s) that you choose here. Loads the popup on only Product Pages that have the Shipping Class(s) that you choose here. Loads the popup on all Product Pages that have a Category. Uncategorized Products will not load a popup. 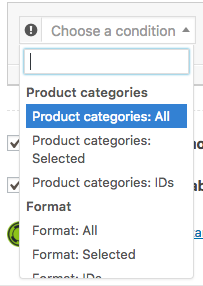 This is the same as Categories: Selected, but uses IDs instead. Loads the popup on all Product Pages that have a Tag. Untagged Products will not load a popup. Loads the popup on only Product Pages that have the Tag(s) that you select here. This is the same as Tags: Selected, but uses IDs instead. Loads the popup on all Product Pages that have a Shipping Class. Products without a Shipping Class will not load a popup. 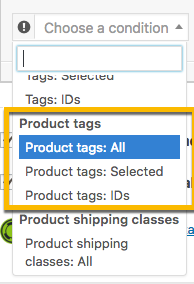 Loads the popup on only Product Pages that have the Shipping Class(s) that you select here. 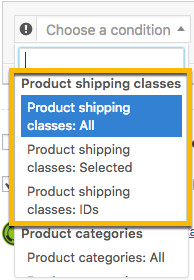 This is the same as Shipping Classes: Selected, but uses IDs instead.